This relaxation guided meditation will help you unwind and heal after a long day. It’s perfect for anyone feeling anxious or dealing with a lot of stress. 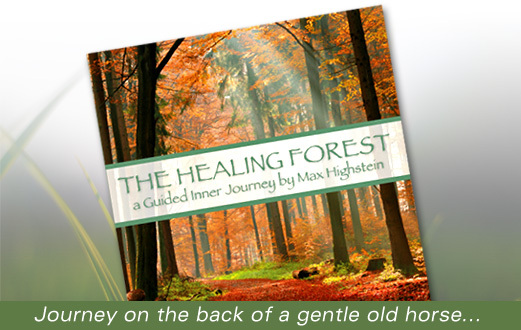 Before bed, or anytime you’re feeling out of balance, use The Healing Forest guided meditation to relax. "Soon, your horse comes to a stop next to one particularly beautiful tree, a very tall one, that appears quite old. Knowing that this tree has something special for you, you gently dismount, stepping down to the soft ground. Your horse knows to wait for you, and as you turn to face this tree, you can feel your heart begin to open. Something magical is being exchanged between your heart, and the heart of this tree, something that goes deeper than any words could describe. It is as if all the loving energy from heaven and earth is being communicated from the forest, directly to you. Take a deep breath, and let it in..."
"I've always felt the woods to be just about the most healing place to be, and I've wanted to make a guided meditation about this for quite some time. This one combines the things I find most healing about the forest -- the colors and light, the sense of peace I get from the trees, the earthy smells -- with a quiet ride on horseback. I hope you'll find this meditation relaxing and healing, and will let me know."